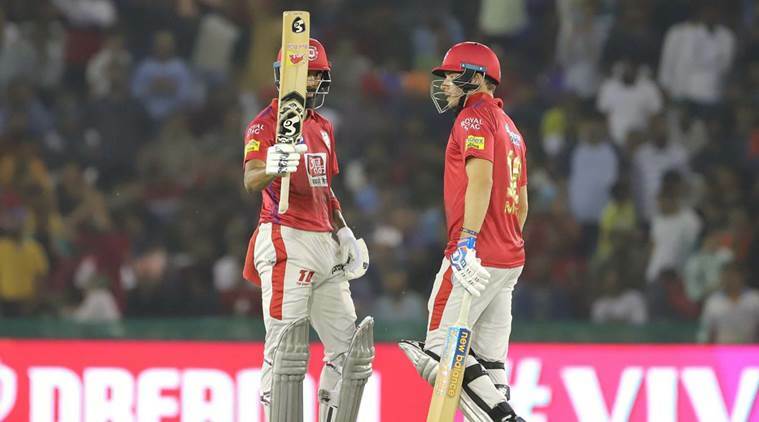 IPL 2019 Live Score Online, KXIP vs MI Highlights: KL Rahul smashed an unbeaten 71 runs in 57 balls as Kings XI Punjab beat Mumbai Indians by 8 wickets. FIFTY! KL Rahul smashes a delivery as he swivels on the hook to send it flying away to the right of short fine leg. He brings up his fifty - 1st this season. This will calm down some nerves. KL Rahul has found a new gear all of a sudden - He has smashed a six and a four in Hardik Pandya's over. David Miller does even better as he smashed a boundary in the final ball. WICKET! Mayank Agarwal has slammed Krunal Pandya for another six. Flat, full, angling into middle stump. Not full enough to deny Agarwal elevation after he gets his front leg out of the way and swings through the line for a flat six to the right of long-off. BIGGIE! Mayank Agarwal steps up to Krunal Pandya and smashed him for a straight six. He brings up 100 for KXIP in the 12th over in style. Mayank Agarwal was out of his crease and was almost Mankad by Krunal Pandya! KXIP have been warned and they almost tasted their own bitterness. FOUR! Mayank Agarwal ends the 9th over with his 3rd boundary. He is on fire from the get go and this will relieve pressure from KL Rahulw who is clearly struggling in the middle. Agarwal off to 14 runs in 6 balls. SIX! Much-needed six from Chris Gayle and he has just slammed a full-pitched delivery from HardiK Pandya. Bowled at his legs, Gayle crushed it over mid-on. Massive. SIX! And here comes another - this one a lot straighter! 50 up for KXIP! Out of first 36 balls, 19 have been dot balls. KL Rahul is really struggling here to score boundaries and Chris Gayle is not quick between the wickets. KXIP in shackles. WHAT A STRAIGHT DRIVE! Lasith Malinga goes yorker and Chris Gayle just pushed it past the bowler - this cannot get any straighter and you cannot set a field for that. Gayle storm has arrived in Punjab - The Windies batsman has smashed Mitchell McCleneghan for two consecutive sixes. He is looking to pick up pace in the innings after a slow start in the first two overs. Chris Gayle and KL Rahul out to open the innings for Punjab. Mitchell McCleneghan has the new ball for Mumbai Indians. CHASE IS ON! 9 runs and wicket in the final over - Mumbai Indians reach 176/7 in 20 overs. Kings XI Punjab need 177 runs to win. SIX! Hardik Pandya has slammed Shami on slower ball which ended up as a full-toss on off stump. He takes a big back-and-across step, which allowed him to get underneath this ball and he whipped it away over wide long-on. FOUR! Shortishoffcutter, only gets up to waist height on off stump, and Pandya pulls it away into the big gap between deep midwicket and deep backward square leg. SIX! LONG, LONG and LONG! This has gone miles into the stands and it is another six for Quinton de Kock into the innings. Mumbai Indians are 120/3 after 13 overs. FOUR! Quinton de Kock goes long! He has smashed it hard and the ball just fell between two fielders in the deep. One bounce boundary and a half century for him in 35 balls. His 7th half century in IPL. Yuvraj Singh joins the party! FOUR! Yuvraj Singh has sliced it over mid-off for a boundary. Pitched on leg, and that is his area. He gets his first boundary in the match. FOUR! And a straight drive from Yuvraj Singh two balls later. 100 up for Mumbai! Quinton de Kock releases pressure as he goes after Murugan Ashwin. Two consecutive boundaries does the trick. This will settle down Mumbai's nerves after two quick wickets. Why was Ashwin's first over 7-ball over? NOTE: The first over was a 7-ball over because the first ball was a dead ball - official scorer to reporters. FOUR! Rohit Sharma steps up to Andrew Tye, and then slices it fine. The ball races to the boundary. Good adjustment by the batsman, as he changed his stance in the middle of the shot. FOUR! Rohit Sharma now pulls it towards fine leg. Back to back-boundaries. 50 up for Mumbai Indians in 5 overs. SMASH AND BURN! Rohit Sharma creams it over the mid-off for another boundary. Mandeep Singh gave it a good chase, but he stopped thinking it will not race to the boundaries ropes. But then it did. A change in attack brings some relief to Mumbai Indians. Hardus Viljoen gives away just 7 runs in his first over. Andrew Tye comes out to replace R Ashwin on the other end now. He was the Purple Cap winner last season. ...FOUR! A little top spin from Ashwin and de Kock swung his bat towards mid-on. The ball went just over the fielder at backward square leg, who jumped in the air to pluck it, but missed out on it. It will clear the boundaries. 13 runs from Mohammed Shami's over. A couple of boundaries from Mumbai captain. This is a fine start from Mumbai who are scoring at 10 runs per over in the first two overs.